The story of Gayway begins with Frank, a young man who is resentful of his father for not accepting him for being gay. However, one day his father dies. Although word is that it was a suicide, Frank knows that something suspicious going on. As such, he rounds up a few of his friends and heads into Strongtown in order to find his father’s killer. Unfortunately, the town is incredibly unfriendly to strangers — but that’s hardly going to deter this crew from finding the truth. Gameplay itself takes the form of a classic point and click adventure. It appears developer Camouflame is inspired by the likes of LucasArts classics, among others. One just needs to look at their text-based interface. 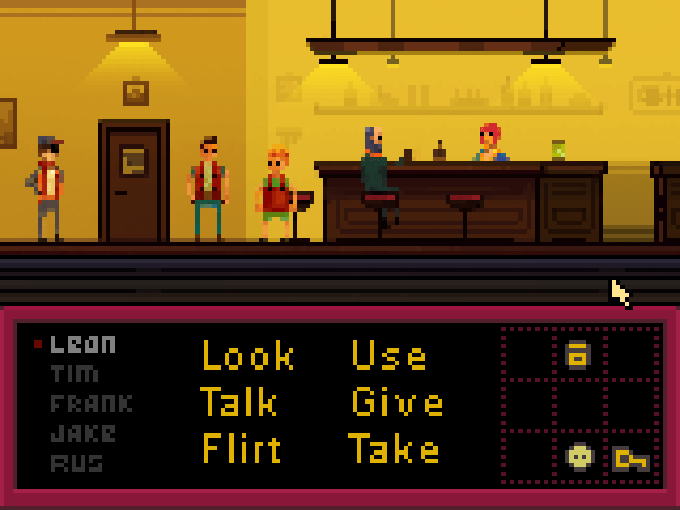 Players can use expected verbs such as “talk,” “use,” and “give” but also “flirt.” It’s unknown just yet how helpful that latter command will prove, or if it’ll be more of a joke option akin to Leisure Suit Larry and the zipper command. Players can also switch between Frank and his four friends when needed to overcome different puzzles. Unfortunately there doesn’t appear to be a demo available for Gayway yet. With that said, an image with “lorem ipsem” placeholder text implies (to me, anyway) that’s where a demo link may be placed later. Gayway needs to raise a fair bit of funds to come to Windows, Mac, and Linux machines: $54,150 (converted from Euro). Point and click adventure games have definitely made that much before. Developer Camouflame is just going to have to seriously get the word out to ensure enough people discover their title over the coming month. Track the progress of the Gayway Kickstarter in our Campaign Calendar.